Open to all ages. Held in a portion of the Grand Bean Room. Local Chocolatiers will sample and sell their decadent creations. Free admission, open 9:00am to 4:00pm. Enjoy samples from chocolatiers and confectioners and visit an extension of the Visitor's Centers own Jelly Belly Chocolate Shoppe! For those 21 and over, and who are seeking a more personal experience, the Jelly Belly Visitor Center will be hosting the Jelly Belly Chocolate & Wine Experience in the Very Cherry portion of the Grand Bean Room. Includes souvenir Jelly Belly wine glass. Featuring wines from local Suisun Valley vintners paired with hand-made confections from the Visitor Center Chocolate Shoppe and chocolate confections created by Jelly Belly. Craft and quality vendors will set up shop outside the Jelly Belly Visitor Center offering unique hand-crafted items created by artists and artisans from all points in Solano County and beyond. Return soon to see a list of arts and crafts vendors. Kids of all ages are invited to enjoy family friendly carnival attractions, including rides. Rides do require ticket purchase. ATM available on site. Acts from the local area and beyond will grace the Jelly Belly stage over our two-day event. Click here to download entertainment schedule. Performances are free and will take place just outside the Jelly Belly Visitor Center. 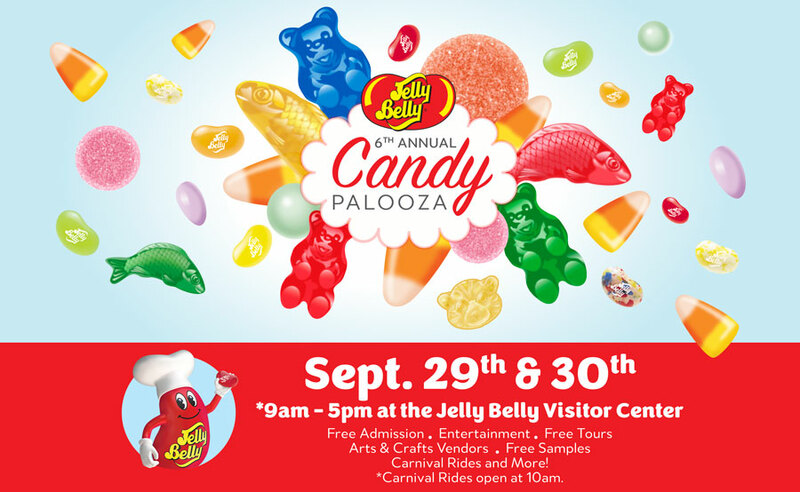 The Chocolate Experience at the Jelly Belly Candy Palooza will be held inside the Jelly Belly Visitor Center. Click here to download the Jelly Belly Chocolate Experience Vendor Agreement which contains information on participation fees, application deadlines, and other important information. All outdoor arts and crafts exhibitors must contact and apply for participation with Brenda Mossa of Brenda Mossa Events™ by visiting the business Facebook page at Facebook.com/BrendaMossaEvents, or by phone at (707) 399-7195. For Brenda Mossa Events vendor information and application, click here and click here for required Special Event Organizer's Application.